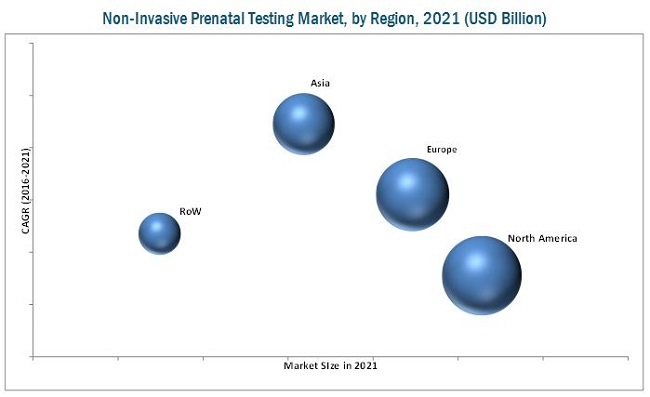 [150 Pages Report] The non-invasive prenatal testing (NIPT) market is expected to reach USD 2.88 billion by 2021 from USD 1.35 billion in 2016 at a CAGR of 16.4% during the forecast period. The major factors driving the growth of this market include the growing preference for non-invasive techniques over invasive methods, rising focus on reimbursement for NIPT, launch of new and advanced NIPT products, and increasing maternal age (associated with growth in the risk of chromosomal abnormalities in babies). Furthermore, untapped emerging markets are expected to offer potential growth opportunities to players operating in the NIPT market during the forecast period. Maternal age refers to the age of women at the time of delivery. Advancing maternal age can result in a number of health complications, such as decreased fertility and high blood pressure, and increase in the risk of miscarriage, stillbirths, and maternal death. Moreover, advancing maternal age can increase the risk of genetic disorders in babies as a result of the improper chromosomal division. The resulting abnormalities in babies may include microcephaly; short neck; upward slanted eyes; poor muscle tone; heart, intestine, and breathing problems; and other issues. In the U.S., around 10% of babies were born to first-time mothers at the age of 35 years or older, in 2016. Also, the median age of first-time mothers increased from 24.9 years in 2000 to 26.3 years in 2014 in the country (Source: CDC). According to Eurostat, in 2013, around 40.6% of women in the European Union who gave birth to their first child belonged to the age group of 30 years and above. Also, in the same year, around 65,500 births of first children were reported in women aged more than 40 years. According to Statistics Canada, in 2013, approximately 43% of births in the country were reported in women belonging to the age group of 30 to 49 years; in 1993, only 26% births were reported in women belonging to the same age group. In Australia, the average age of first-time mothers increased from 27.8 years in 2003 to 28.6 years in 2013 (Source: Australian Bureau of Statistics, 2015). In order to detect genetic abnormalities resulting from improper chromosomal division, there is a growing demand for developing advanced and effective diagnostic procedures for early screening. Non-invasive prenatal testing is one such upcoming field which utilizes cell-free DNA in maternal plasma/fetal cells in maternal blood to determine genetic abnormalities. Thus, with the growing incidence of chromosomal abnormalities and benefits offered by NIPT, the demand for these tests is expected to increase in the coming years. During this research study, major players operating in the NIPT market in various regions have been identified, and their offerings, regional presence, and distribution channels have been analyzed through in-depth discussions. Top-down and bottom-up approaches have been used to determine the overall market size. Sizes of the other individual markets have been estimated using the percentage splits obtained through secondary sources such as Hoovers, Bloomberg BusinessWeek, and Factiva, along with primary respondents. The entire procedure includes the study of the annual and financial reports of the top market players and extensive interviews with industry experts such as CEOs, VPs, directors, and marketing executives for key insights (both qualitative and quantitative) pertaining to the market. 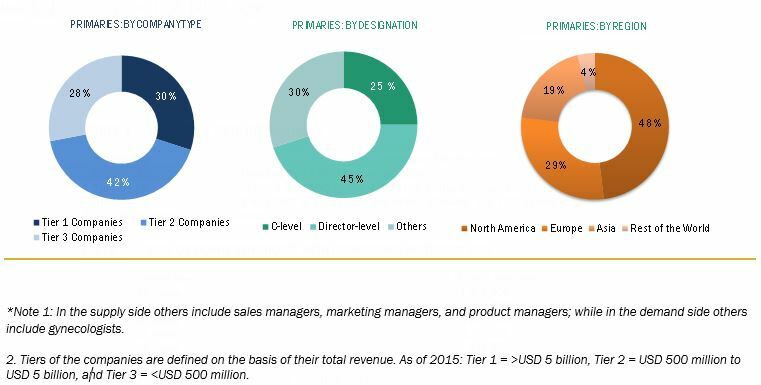 The figure below shows the breakdown of the primaries on the basis of the company type, designation, and region considered during the research study. The NIPT market is competitive in nature, with several major players competing for market space. Some of the prominent players in the market include Illumina, Inc. (U.S.), Thermo Fisher Scientific, Inc. (U.S.), F. Hoffmann-La Roche Ltd. (Switzerland), Pacific Biosciences of California, Inc. (U.S.), PerkinElmer, Inc. (U.S.), QIAGEN N.V. (Germany), Agilent Technologies, Inc. (U.S.), Beijing Genomics Institute (China), GE Healthcare (U.S.), and Koninklijke Philips N.V. (Netherlands). In November 2016, GE Healthcare launched its ultrasound system—LOGIQ E9 XDclear 2.0 and showcased 25 new products at the Radiological Society of North America (RSNA) (U.S.). The showcased products included Senographe Pristina, SIGNA, DiscoveryMI and GSI Xtream on Revolution CT2, OptimaXR240amx, and other digital and software technologies. These products offer improved performance, productivity, and better clinical outcomes for clinicians and hospitals worldwide. In March 2016, Thermo Fisher Scientific acquired Affymetrix, Inc. (U.S.), a leading provider of life science and molecular diagnostic products. This acquisition enabled the company to strengthen its bioscience and genetic analysis capabilities. Note: Other instruments include centrifuges, UV systems, incubators, and microscopes. Note: Others applications include Monogenic disorders, Klinefelter syndrome, Gender detection, and rhesus (Rh) blood type. The non-invasive prenatal testing (NIPT) market is expected to reach USD 2.88 billion by 2021 from USD 1.35 billion in 2016, at a CAGR of 16.4% from 2016 to 2021. The major factors driving the growth of this market include the growing preference for non-invasive techniques over invasive methods, rising focus on reimbursement for NIPT, launch of new and advanced NIPT products, and increasing maternal age (associated with growth in the risk of chromosomal abnormalities in babies). Furthermore, untapped emerging markets are expected to offer potential growth opportunities to players operating in the NIPT market during the forecast period. The market in this report is segmented on the basis of product, method, application, end user, and region. Based on product, the market is segmented into consumables and instruments. The consumable segment is further divided into assay kits & reagents and disposables. The instruments segment is divided into ultrasound device, NGS systems, PCR instruments, microarrays, and other instruments. In 2016, the consumables segment accounted for the largest share of the market. The high growth in this segment is attributed to the repeated requirements of consumables as compared to instruments in NIPT. Based on method, the market is further divided into ultrasound detection, biochemical screening tests, fetal cells in maternal blood tests, and cell-free DNA in maternal plasma tests. In 2016, the ultrasound detection accounted for the largest share of the market. However, the cell-free DNA in maternal plasma tests segment is expected to grow at the highest CAGR during the forecast period. This is mainly attributed to the increasing demand for cf-DNA based techniques in NIPT testing and rising government initiatives to provide prenatal services. Based on application, the market is divided into Trisomy, microdeletion syndrome, and other applications. Trisomy forms the largest and fastest-growing application segment of the global market. This is mainly attributed to the rising incidence of chromosomal abnormalities with increasing maternal age. Based on end user, the market is segmented into diagnostic laboratories and hospitals. In 2016, the diagnostic laboratories segment accounted for the largest share of the market. Growth in this end-user segment can be attributed to the rising incidence of chromosomal abnormalities and increasing initiatives by companies to provide advanced products in NIPT to diagnostic laboratories. Ultrasound detection is a routine procedure performed throughout pregnancy for evaluating the health and development of the fetus. It is the most widely used non-invasive method for monitoring the health of the fetus. Ultrasound scans provide real-time images showing the movement and external features of the fetus; they can also help identify genetic abnormalities in the fetus. This test is conducted between 11 to 13 weeks of gestation. Biochemical screening tests are used to indicate the presence of some biological compounds present in maternal blood. These tests include biochemical markers used to diagnose fetal chromosomal abnormalities such as Down syndrome. Emerging countries have immense opportunities for the growth of NIPT product manufacturers, will this scenario continue? Lack of skilled professionals, and reliability of test results especially in obese women are major factors restraining the growth of the market. Some of the prominent players in the market include GE Healthcare (U.S.), Koninklijke Philips N.V. (Netherlands), Illumina, Inc. (U.S.), Thermo Fisher Scientific, Inc. (U.S.), F. Hoffmann-La Roche Ltd. (Switzerland), Pacific Biosciences of California, Inc. (U.S.), PerkinElmer, Inc. (U.S.), QIAGEN N.V. (Germany), Agilent Technologies, Inc. (U.S.), and Beijing Genomics Institute (China). 12.5 Thermo Fisher Scientific, Inc.
12.6 F. Hoffman-La Roche Ltd.
12.7 Pacific Biosciences of California, Inc.